Weeks passed following the fire. Orion was summoned several more times to Lady Suzu’s chambers to be certain she would become pregnant. He wasn’t sure that was the real reason but he didn’t mind. He had pleasant thoughts about the time spent with Lady Suzu but he didn’t feel it was right to talk to Phoenix about it… not yet, at least. The fire had been the topic of gossip throughout the community. What did this fire mean? Was it an omen of an approaching evil to their clan? Suzu didn’t believe it one bit. She put on a front to the women of the community but personally she didn’t think it meant anything. Well, mostly. She still had a nagging thought that maybe it was a premonition of something happening in the future. Tatiana was another story. She had yet to breach the subject of Phoenix fathering her child with Phoenix himself. It was her fault that the fire started…and his name was related to fire. To Tatiana it sounded like a warning and that scared her. She wondered if she should rethink her plan. Phoenix and Orion felt pride from their defeat of the fire. Neither believed it was much of an omen. They wouldn’t say it aloud but it had been Tatiana’s foolishness for not extinguishing her incense when she went to bed. They decided to prepare for any future fires they would leave out more water buckets. Bright one morning, Orion quietly ate his meal with the others. Tatiana and Phoenix spoke to each other animatedly about something or other; Orion paid them no attention. That is, not until he heard Phoenix say “child”. He whipped his head around to look at the pair. Tatiana and Phoenix looked at each other excitedly and Tatiana answered him. “Lady Suzu was feeling ill last night and asked me to fetch Lady Lakshmi after breakfast! We think she might be with child!” Orion felt his heart lift and he knew his face betrayed his feelings. Orion felt excited but also worried that so much planning for a heiress would be all for nothing if the child turned out to be a boy. Would they still celebrate then? Following breakfast, Tatiana went to fetch Lady Lakshmi. She was both a gardener and midwife for her clan. A strange combination, you might think, but in the smaller clans of this community everyone carried many torches. Suzu also liked her very much so she felt comfortable in her presence. 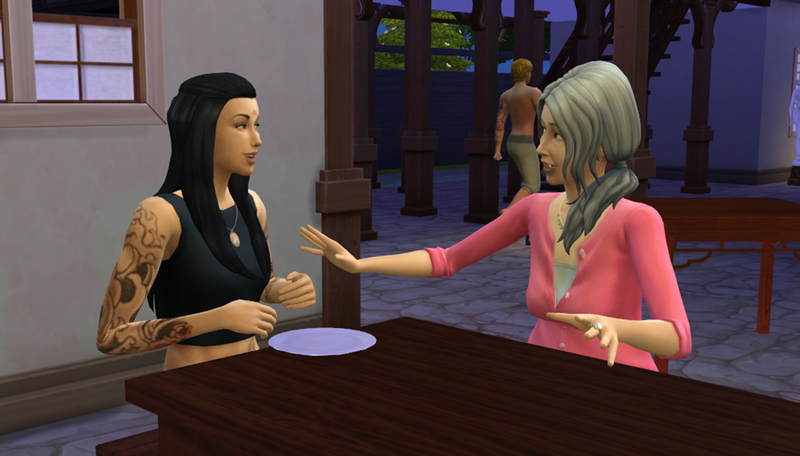 Following the examination, Lady Lakshmi joined Suzu at the dining table to go over some advice for the remainder of her pregnancy. “Lady, you are very healthy. If you continue to practice your meditation and exercise you will be fine. I will advise you to drink a potion we use in my clan.” Suzu looked surprised. Suzu was pleased and began to rise; Lady Lakshmi stopped her. Suzu prevented herself from rolling her eyes and sat down again. Lady Lakshmi continued. I really hope the fire means something, so Suzu will learn to be a bit more respectful concerning traditions. Yeah, she can be a little stubborn with some things! She’s getting better with age, though. I like the way of thinking.